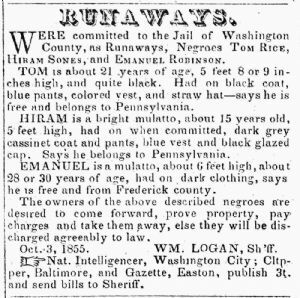 WERE committed to the Jail of Washington County, as Runaways, Negroes TOM RICE, HIRAM SONES, and EMANUEL ROBINSON. TOM is about 21 years of age, 5 feet 8 or 9 inches high, and quite black. Had on black coat, blue pants, colored vest, and straw hat—says he is free and belongs to Pennsylvania. HIRAM, is a bright mulatto, about 15 years old, 5 feet high, had on when committed dark grey cassinet coat and pants, blue vest and black glazed cap. Says he belongs to Pennsylvania. EMANUEL is a mu1atto, about 6 feet high, about 28 or 30 years of age, had on dark clothing, says he is free and from Frederick county. Oct, 3, 1855. WM. LOGAN, Sh’ff.